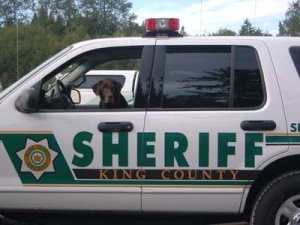 King County Search Dogs was formed in 1996 as a 501(c)3 non-profit corporation in Washington State. KCSD is a unit of the King County Search and Rescue Association and provides canine search services within King County at no cost. All handlers are volunteers who provide their own dogs and train several times a month. They pay all related expenses for feeding, veterinary care, travel, and purchase of needed equipment. Our History. King County Search Dogs was formed in 1996 at the request of the King County Sheriff’s Office who was looking for experienced dog trainers and handlers from around the area. Four of the original founding members remain active with the unit in 2016! KCSD began serving the King County Community in 1997. Early in the unit’s life, we were called into service frequently to help in the recovery of missing people who were presumed dead. We spent a memorable year assisting in locating the remains of a number of victims of serial killer Gary Ridgeway (aka Green River Killer). KCSD also responded on six of the first eight days to the tragic 2014 Oso Landslide in Snohomish County that killed 43 people. We respond to an average of 50 missions a year of varying types and have learned that the missing persons search missions we responded to require about twice as many airscent dogs as trailing dogs. This helped us develop our policy of limiting the number of dog teams in the unit to 30 with a roughly 2:1 ratio of airscent to trailing dog-handler teams. King County Search Search Dogs operates under the Bylaws of its Articles of Incorporation and manages membership, training, certification and mission protocols through a set of Standard Operating Procedures that are updated as required.